GoerTek LCD Writing Board is suitable designer, business man, teacher, students etc. It will be your good helper when making note. draft or doing the math. You can also leave important message for your family members with this on table、desk、refrigerator. 1. Normally one button clear all thing. Please change battery when it can't be clear. 3. Don't let board soak in any liquid. 4. Don't use sharp stuff to touch surface. ✎.Main Functions: Writing and Drawing on the tablet is just like on the paper. It's suit for kids writing, drawing, office memo board, fridge message board and as a comunication tool. ✎. Environmental Protection:Write or draw with the included plastic stylus or any other suitable instrument - even your finger! You'll never need to search for a pen or pencil again. And you can save 1000 pcs paper every year! ✎. 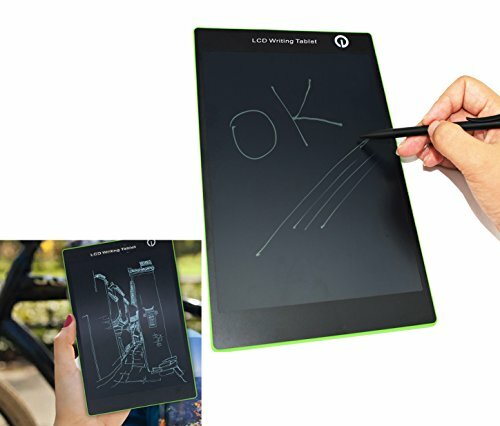 Erase your image or words with only touch of a button,a friendly flash from the liquid crystal display, convenient for kids drawing, making notes lists drafts doing the math and business etc. If you have any questions about this product by ACJENY, contact us by completing and submitting the form below. If you are looking for a specif part number, please include it with your message.